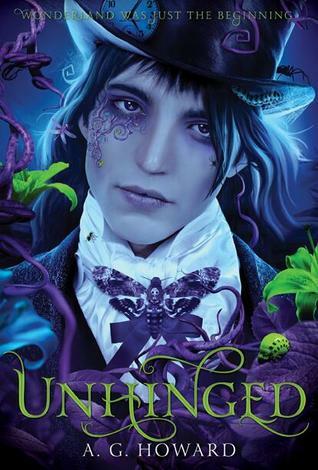 welcome to the unhinged giveaway! If you love Alice in Wonderland like I do, then you can't miss A.G. Howard's phenomenal urban fantasy revamp. Splintered is the fantastic opening, with teenage Alyssa finding her powers in a dark, twisted Wonderland. Just released is Unhinged, where Wonderland meets the overland and Alyssa is caught between. So come on. 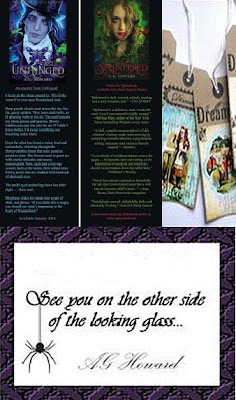 Join the giveaway and you may win (1) a copy of Splintered or Unhinged (your choice) or (2) a swag pack from A.G. Howard! And while you're here, please consider checking out some of the other reviews and features on Sarcasm & Lemons. Cheers! This giveaway will run until February 14th. Splintered is on my wishlist so I'm keeping my fingers really crossed, thank you. Any time! More will be coming up soon. I'd love to get my hands on Splintered ! Its been on my TBR list forever !! Good luck! It's a fabulous book.